Jake Chiles is a true native of Asheville, NC and has spent his entire life hunting and fishing in the surrounding mountains. Jake attended NC State University and earned a degree in landscape technology and business management. He returned to the mountains and started a small landscape company in Asheville but soon realized that teaching people to fly fish is his true calling. 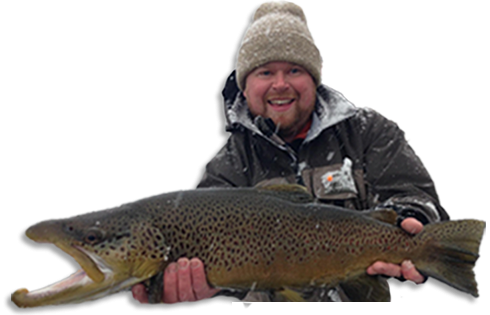 Jake enjoys pursuing picky tailwater trout, smallmouth bass, and giant striped bass. 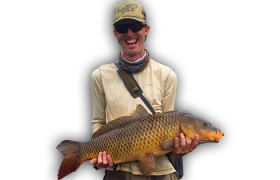 His diverse fishing experience ensures he will help you find the right flies and rigs to make the day a fishing success. Josh Gorelick is a true North Carolina boy and has Bojangles running through his veins. He spent his childhood harassing warm water piscatorial residents of Charlotte, NC, and at 18 bought his first fly rod at Walmart. He has been hooked on trout ever since. Josh is on a mission to catch a fish in every state and has Massachusetts, New Mexico, Wyoming, Montana, California, Arkansas, Tennessee, North and South Carolina crossed off his list. Josh is a graduate student at Western Carolina University and working to become a licensed therapist. He wants to one day combine fly fishing and therapy. Before guiding Josh worked at a wilderness therapy program for struggling adolescents. 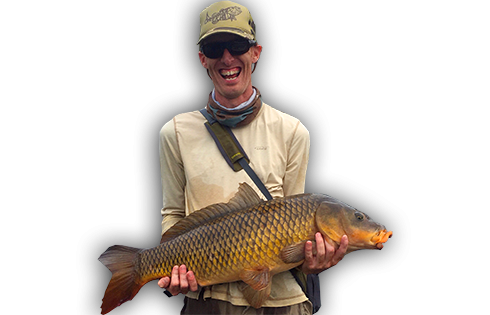 While there he started a fly fishing program and instructed clients on the basics of fly fishing and their therapeutic benefits. 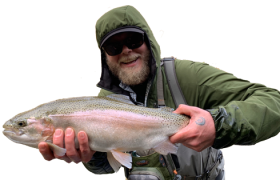 Josh has a deep passion for fly fishing and it really shows when you fish with him (maybe too much when he is not on the water). There is speculation around the shop that Josh might sleep in his waders. 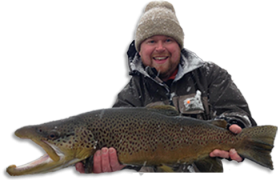 Brown is the owner and head guide for Brown Trout Fly Fishing LLC. 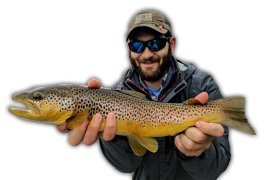 He started fly fishing in Western North Carolina as a teenager and the passion for catching trout on the fly created in NC propelled Brown’s move to Jackson Hole, Wyoming. 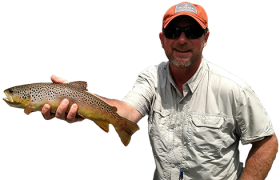 Travis is a native of East Tennessee and has been fly fishing the area lakes, streams and tailwaters since 1976. He is a 20 year veteran guide who still loves helping others catch trout. Travis spent four seasons guiding on the Green River in Dutch John Utah but is now back home and a full time guide in East Tennessee. Travis has a B.S. degree in land surveying, earned a nursing degree in the army, and served in Desert Storm, but most importantly he speaks trout, smallmouth and stripers fluently. When Travis is not fishing, he enjoys shooting steel targets at long range and competing in the Precision Rifle Series. Travis’ dedication to precision will surely show on your trip. Travis currently rows a Stealth Craft Drift boat and meets all his clients in Elizabethton, TN. 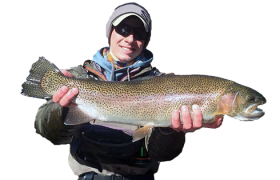 Ryley grew up in Fort Mill, SC and started his fly fishing there on the ponds around town. He started trout fishing on the Davidson river when he was 14 and hasn’t stopped since. 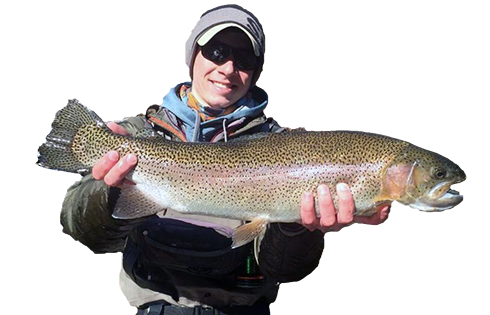 Ryley was a member of the US Youth Fly Fishing Team and fished in tournaments all over the US, and Europe. The US Youth Team won several medals at the World Championship while Ryley was on the team. 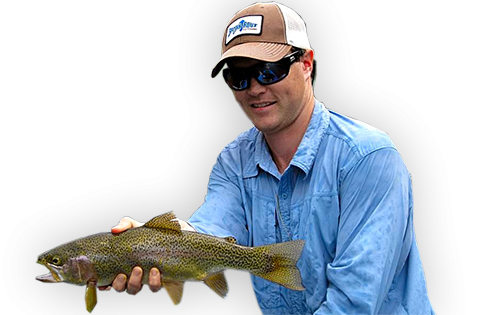 Ryley has worked at ORVIS Charlotte and helped teach fly casting and fishing classes. He currently attends Clemson University and is pursuing a Fisheries and Wildlife major and an Environmental Conservation minor. 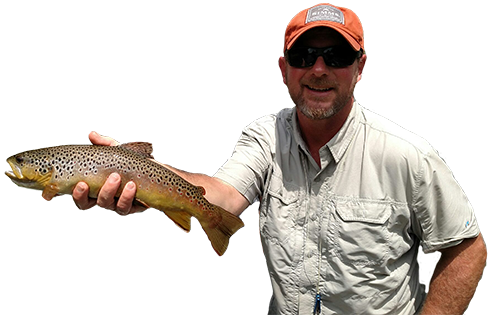 His knowledge of the Western North Carolina fisheries and experience teaching for ORVIS are sure to help make your trip a success. Ryley is a wade trip specialist and meets his trips at the ORVIS store in Asheville. 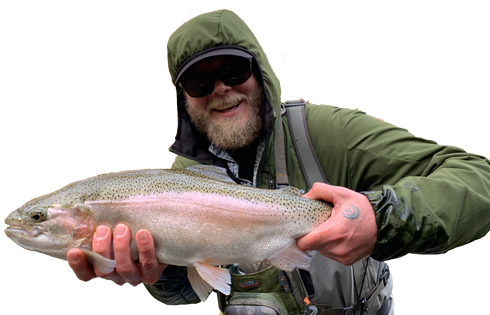 As a native North Carolinian, and on/off again resident of Asheville, Zack Davis felt it was natural to start fly fishing and exploring the rivers winding through the Blue Ridge Mountains of the Appalachians. 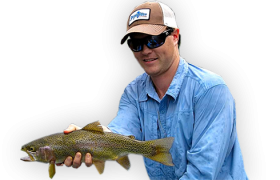 Although Zack feels most at home on the Davidson River, or any other rivers flowing through the wilderness of Western NC, he spent time honing his skills on rivers out West, such as the Rogue and Applegate in Oregon, and in Norway fly fishing in the pristine waters of the Arctic Circle. In an effort to commit further to his passion, Zack then attended Sweetwater Travel Guide School in Montana. Once completed, he returned to North Carolina to enjoy an outstanding 250+ days of fishing in 2018. He looks forward to sharing his experience with others, as well as his love of exploring our beautiful mountains and rivers.